I call these “fluffy clouds” because this is exactly how I feel about these homemade marshmallows. They are so soft and light. I simply couldn’t resist cutting them into little clouds. I noticed that marshmallows have been getting a fair bit of attention lately, appearing in magazines and blogs. There are even books dedicated to making gourmet marshmallows. Some even go as far as saying that marshmallows are the new cupcakes. I’m not sure if marshmallows will ever be the new cupcakes, but it is amazing the things you can do with marshmallows these days with all the different flavours. Since I happen to have all the ingredients to make marshmallows, which is mainly sugar (lots of sugar), I thought why not. I have always been curious about the difference between homemade marshmallows and store brought ones. It is true. The homemade ones are way better. For my first attempt, I decided to stick with the classic vanilla. I used vanilla paste because I love the little specks of vanilla seeds in the white marshmallows. They are like tiny stars, those vanilla seeds. Okay, I know I’m being silly now. You can use vanilla extract if you wish. The cloud cookie cutter is from Herriot Grace. I brought it out of impulse earlier this year and it is my most precious and treasured (and expensive) cookie cutter. I absolutely love it. Actually I love anything cloud at the moment. Lightly spray a 25 x 30 cm baking tin with oil, line the base and two long sides with non-stick baking paper and lightly spray the paper with oil. Combine 460 grams of the sugar, the glucose and 185 ml water in a small, deep heavy-based saucepan. Stir over low heat until the sugar dissolves. Bring to the boil and simmer, without stirring, until the syrup reaches 127°C on a sugar thermometer (this is the upper end of the hard-ball stage). Watch it carefully, as the syrup has a tendency to bubble up. Meanwhile, slowly sprinkle the gelatine over 185 ml cold water in a shallow microwave-safe bowl and set aside for 5 minutes. Heat in the microwave for 30–45 seconds on High (100%), or until the gelatine has dissolved and the liquid is clear. When the sugar syrup reaches 115°C, whisk the egg whites in an electric mixer with a whisk attachment on medium speed. When frothy, increase the speed to medium–high and gradually add the remaining sugar, whisking until thick and glossy. Keep the mixer running on medium speed. Increase the mixer speed to medium–high and gradually pour the hot syrup mixture down the inside of the bowl in a thin, steady stream. Increase the speed to high and continue whisking until the mixture is thick. Add the vanilla bean paste or extract and whisk until the mixture is very thick and holds its shape, about 10–12 minutes, depending on your mixer. The outside of the bowl should almost be at room temperature. 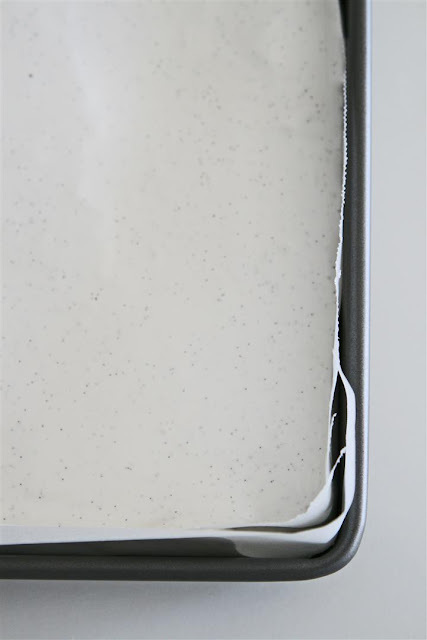 Use a spatula to scrape the marshmallow mixture into the prepared tin and smooth the surface. Stand for 2–3 hours, until set. Meanwhile, to make the coating, sift the cornflour and icing sugar together. Dust the top of the marshmallow with some of the coating and turn out onto a clean surface. Dust the bottom with more coating. Use a variety of cutters or a large knife sprayed lightly with oil to cut the marshmallow into bite-sized pieces. Roll the sticky sides of each marshmallow in the remaining coating, dusting off the excess.